Since the inaugural edition in 2008, Chennai Super Kings have been the most consistent team across every edition of the IPL. They have appeared in the playoffs stage 9 times out of which they have reached the final 7 times. The Super Kings have won so far 3 titles in IPL, which equals the record for most number of title wins - by Mumbai Indians. The team is captained by Mahendra Singh Dhoni, and coached by Stephen Fleming. So far in IPL, CSK have played 148 matches with 90 wins, 56 losses, 1 tie and 1 no result. CSK have the best winning percentage among all teams in IPL at 61.56%. At 90 wins, CSK need just 10 more to get to the magical 100-win mark. No team has achieved that feat yet, although Mumbai Indians are also pretty close. CSK have had several top foreign players in the squad including Stephen Fleming, Matthew Hayden, Michael Hussey, Chris Morris, Makhaya Ntini, Brendon McCullum, Mark Wood, Albie Morkel, George Bailey, Andrew Flintoff, Doug Bollinger and Dwayne Smith. In the past 11 years, Joginder Sharma, Ashish Nehra, Ravichandran Ashwin, Manpreet Gony, Lakshmipathi Balaji, Wriddhiman Saha, Ishwar Pandey, Ankit Rajpoot, Abhinav Mukund, Subramaniam Badrinath and Shadab Jakati have been the notable Indian players involved with CSK, apart from the regulars Suresh Raina, MS Dhoni and Ravindra Jadeja. CSK and Rajasthan Royals were banned in the 2016 and 2017 editions due to allegations of their owners being involved in match-fixing. 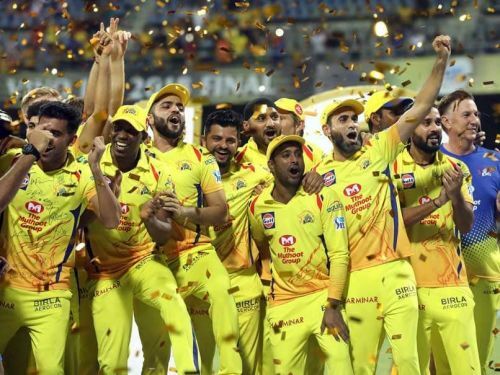 CSK returned in 2018 to win the IPL for a record 3rd time. Raina has been the most consistent performer for CSK. He is currently the leading run-getter in IPL with 4985 runs from 176 matches. He has the record of most successive appearances in the league, with 158 matches for CSK. Dwayne Bravo is the 4th leading wicket-taker in IPL with 136 wickets from 122 matches with an economy of 8.43 and best figures of 4/22. Among CSK bowlers, Balaji and Ntini are two bowlers who have taken a hat-trick in the IPL. Matthew Hayden with 572 runs in 12 matches during the 2009 edition and Micheal Hussey with 733 runs in 2013 have won the Orange Cap for CSK so far. Dwayne Bravo (2013 and 2015) and Mohit Sharma in 2014 had won the Purple Cap award. In the 2018 auction, they bought Dwayne Bravo, Faf du Plessis, Kedar Jadhav, Ambati Rayudu and other experienced players. They retained MS Dhoni, Suresh Raina and Ravindra Jadeja at the mega-auction. At this year’s auction, they bought only two players - Mohit Sharma and Ruturaj Gaikwad. CSK will begin IPL 2019 with a blockbuster encounter against Royal Challengers Bangalore on 23rd March at Chennai.